This sturdy, hand carved wooden piece can be used as a stool, end table or even a plant stand and it will add character, warmth and decoration to your home. It is made of acacia wood which has been hand carved and stained in a whitewash finish, by skilled artisans who have an eye for detail and a love for their craft. It is perfect for that special beach house and you will want to use for many uses... or to even to bring to the beach for watching the sunset. It is great for adults and children and great as an extra seat to bring to the table for a cozy dinner. In addition to the large carving of the fish on the top, it also has smaller carvings of the fish on all 4 sides of the skirting. It is a fun, yet elegant piece to have around and easy to move from one occasion to another. It is sturdy enough to endure lots of years of use. Great for indoor or outdoor use. Size is 18 inches tall x 11 inches wide and 11 inches deep. 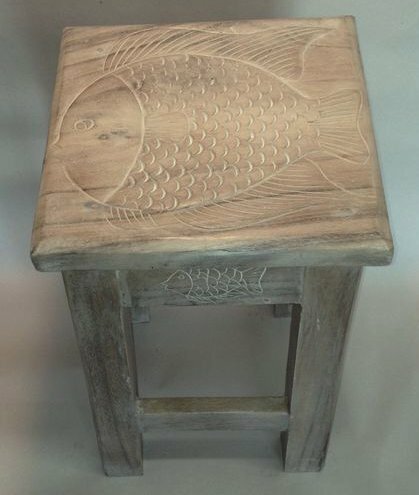 Also available in stained finish and sold as Fish Hand Carved Wooden Stool/Table (Stained).